This Saturday is very special for us. Reader Girls is the very first stop of Sparkle's Song Book Tour, a tour hosted by blogs both in the US and the UK. Published by Maverick Books, this delightful picture book is one we are certainly happy to host. Summary: Sparkle’s life feels empty without music, so when she hears music coming from the forest she cannot help but follow it. Sparkle is sent to live with her Aunt Mildred in the middle of nowhere. Sparkle’s radio is banned from the house. One day whilst playing outside Sparkle hears beautiful music coming from the forest. She goes in search of it but soon finds herself lost amongst the trees. She meets a songbird and a group of talking instruments, where she learns why her aunt has banned music. She returns home and persuades her Aunt to play the piano with her. 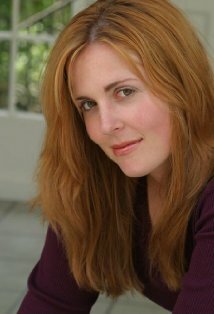 About the author: American author, Samantha Hale, is a film maker, who directed ‘Map the Music’ about the power music has in everyday life. (From Maverick Books) We came across Samantha Hale on the internet with her work as an accidental filmmaker. We soon realised that Sam was extremely creative with a special passion for music. Samantha lives in Los Angeles in America and has also created a documentary film titled ‘Map the Music’. About the illustrator, Mariana Ruiz Johnson: (Also from Maverick Books) We met the illustrator Mariana at Bologna Children’s Book Fair and were absolutely knocked out with her portfolio. Mariana lives and works in Argentina and works often in Gouache a painting technique that gives a very rich and vibrant feel. Karen & I have since been to the illustrators school in Bueanos Aries to meet other Argentian Illustrators , the level of creativity and passion for childrens books is quite amazing. Look out for other books from these lovely illustrators. At this moment we are all waiting for news as Mariana is expecting her first baby. Sure to make a lovely Mum! Imagine a home without music. 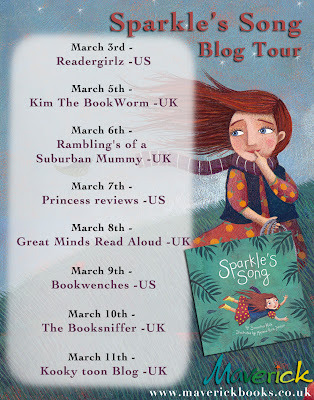 Sparkle, a sweet eight year old girl dealing with the sudden death of her parents, finds herself in such a place when she has to go live with her Aunt Millicent. In this new home there are rules: no singing, dancing or music. Sparkle's old life was the exact opposite so what is she to do? One day she takes her little radio outside and turns it on. A song begins to play. Within moments the trees start to sway to the beat and Sparkle realizes she's not the only one who loves music. The next morning, Sparkle couldn’t wait to play outside again. But her aunt had taken her radio, so there wouldn’t be any music today. She stood in her Aunt’s overgrown garden. The trees were still but then, they started to dance. Swish! Swoosh! And the gentle sound of music – a violin – could be heard. Can't you feel the wind blowing around gazing at that two page spread above? I can. Love the leaves and the leaning flowers, and the expression on Sparkle's face is priceless--so many emotions captured in this moment. Tender, sweet and moving, Sparkle's Song will certainly touch anyone's heartstrings. The story truly comes to life with Mariana Ruiz Johnson's illustrations. Colorful, bright and cheerful, the reader is just as amazed as Sparkle is when she enters the woods and finds more than trees waiting for her inside. – the rustling of the trees and the chirping and tweeting of the birds. She knew Piano was right. her when she was sad? Isn't that illustration wonderful? I may be an adult but wonderful picture books--when the perfect marriage between prose and picture occur upon the pages (or ereader screen), a certain type of magic happens--and this combination makes them ageless. Despite the sad subject matter, as we watch Sparkle get accustomed to her new home and search for an outlet to find music, we too become wrapped up in her quest to let anything sorrowful affect us. Besides, sometimes during our journey we find an outlet that lets us cope. For Sparkle, music is her 'outlet' and it helps her remember and honor the memory of her parents. And by the end, which is a happy one, we know both Sparkle and her aunt will be fine. The story's message--about the incredible power of music--will resonate with many. There is so much music can do for us and our heroine and her aunt learn an important lesson too. 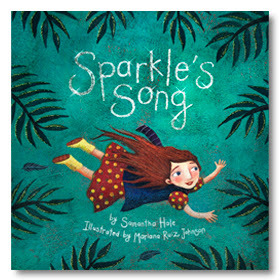 Recommended for young readers five and up, Sparkle's Song is a special book with whimsical art and an endearing main character. I hope many others get the opportunity to experience this wonderful picture book. Cover comment: I don't know about you but the cover art makes me want to fly too. Book source: Received a promotional ebook copy from another author for my honest review.